Besides regular group classes, I.D.E.A also offers Private Coaching for a whole range of reasons. You may consider 1-on-1 Classes to fit your busy schedule. Or to learn in privacy, or maybe if you’re planning to surprise or gift someone with your dance presentation. You may learn for Special occasions such as weddings or festivals, competitions etc. Private lessons can be for general or custom dance styles, or customized concepts & choreography. Private Coaching is offered to individuals & groups at their home or at a center. Learn any style you wish to learn- from Bollywood, Folk, Classical, or really anything you have in mind. Get detailed 1-on-1 attention and feedback. Dance to a style of your choice: Classical, folk, fusion, urban. You may also Mix n’ match classes with our group lessons, or participate in academy performances. Learn at your convenient times – work it around your job, kids, travel plans. Learn at your convenient place – No need to battle the traffic to get to class. Learn at your pace: No deadlines, just go at your comfortable pace. Just be there at your designated time and space- our efficient and professional tutor takes care of the rest! No dance space at home? Bring your private group to a spacious, fully-equipped centre. * All private class Bookings by prior appointment. Slots subject to availability. 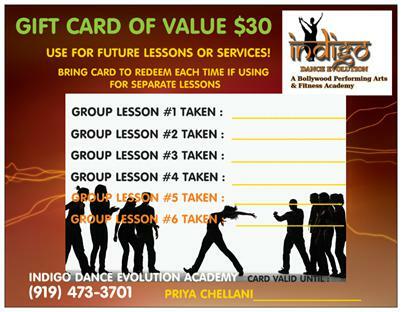 One $10 gift card subject to our schedule, may be used towards group classes only at select centres. Watch how a private class helps your dance goals within 2-4 lessons. *The following videos are for demo purpose of real outcomes, however, each student learns at their individual pace. Need to Book a tutor for a lesson? Contact us today to discuss your specific needs & case.